A friend of mine just framed a painting that I did en plein air (out of doors) as a birthday present. It inspired me to present to you a work that you may not have seen by one of my favorite Impressionists: Pierre-Auguste Renoir. Every now and then I like to show you a little-known gold nugget by a well-known artist of the past. This, to me, is the epitome of what it means to paint outdoors: a quick sketch that may work its way into a painting in the studio. I know that’s not how the Impressionists worked, but that’s why I paint outdoors: studies during the temperate months in order to fuel me during the winter in my living room studio. I think it’s important, as an artist, to work outdoors and lay down what we see. It can really come back to inform our future works when we think about light, how light affects color, and even composition. I think this tiny piece is one of the most charming works from Renoir’s late period. It’s obviously a depiction of the Seine at some point out of Paris, probably somewhere near the Café Fournaise in Chatou. 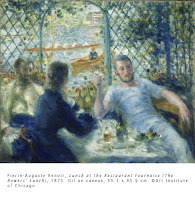 The Café Fournaise is now a museum that houses works by many of the companion artists of Renoir who flocked to the suburb of Paris to paint the scenery. 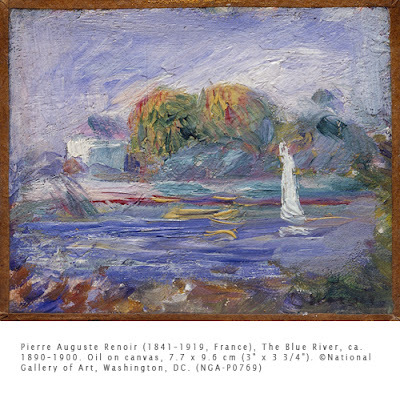 What’s wonderful about this work is that it is a quick study, where we see the singular goal of Impressionists to capture a fleeting moment of light and its effects of local color (the color of an object). Also, may I say, it’s just a great little painting! Renoir departed briefly from Impressionism in the 1880s after visiting Italy and being impressed by works from the Italian Renaissance and Baroque. He returned to Impressionism in the 1890s and continued to work in that style until his death. Despite his on-going predominant interest in the figure, Renoir continued to produce landscapes throughout his career. Unlike his figurative compositions that were done partially outdoors and partially in the studio, he still painted landscapes completely outdoors. This work comes from a period that was dominated by portraits and studies of nudes.